get my columns via this site, anyway, and representing the very newspaper that was given out at Thunder Road gave me no press courtesies. 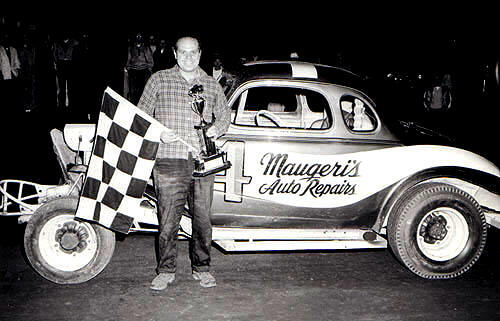 Most of the best writers in this neck of the woods have taken their shot at writing about Dynamite Dave Dion, the remarkable Hudson, NH driver who has, forever, etched his name into the annals of racing in the East. Dave Moody wrote a great book, and Lew Boyd did a memorable tearoffs column on Dion. I just wanted to put in my two cents’ worth, because I consider the man a friend – not just a topic opportunity. Nobody needs me to recount all the Dion stories or the exploits, so I will limit this to personal reflections and stories. 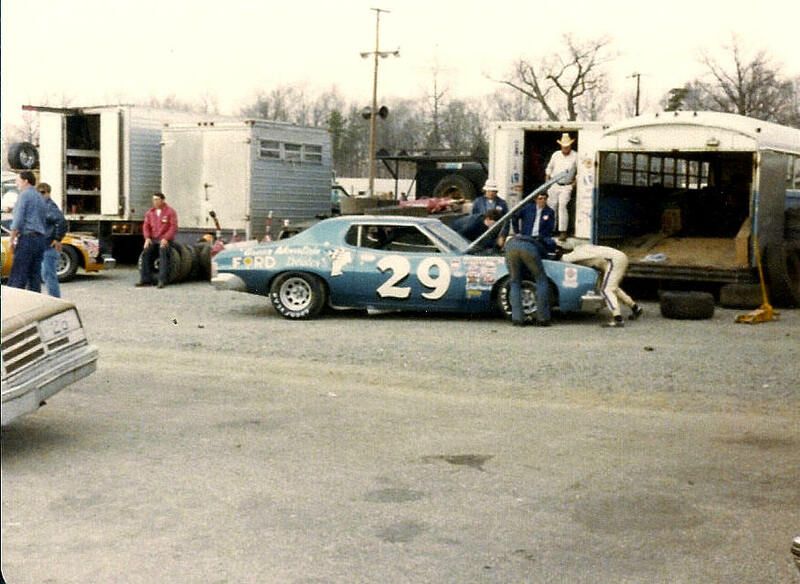 Around 1972, Catamount Stadium [and Northern NASCAR] was attracting a legion of new competitors for its burgeoning late model sportsman ranks. The local drivers, while having run a lower level of late model for years, were still getting used to having the better equipment to run. 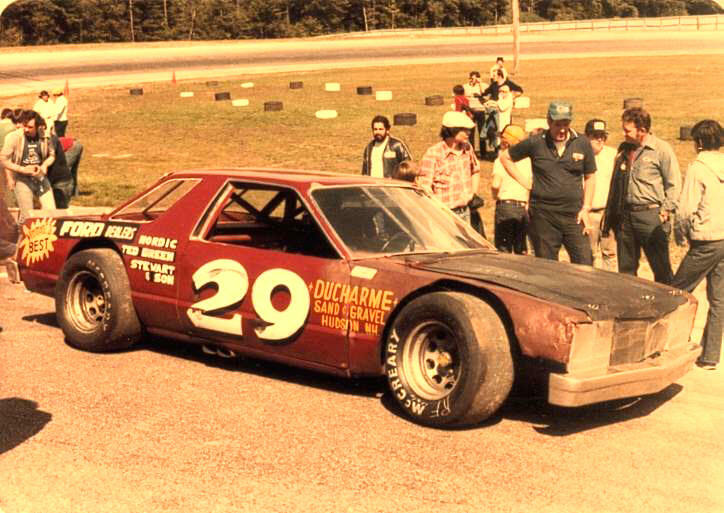 Danny Mostrianni brought up the first Norwood Torino to Catamount. Norwood Arena was experiencing a similar upgrade in its late model ranks, and a lot of the Arena competitors were inspired to try their luck, much further to the north, to that track that had long had been known for having some of the top modified competition in the past. 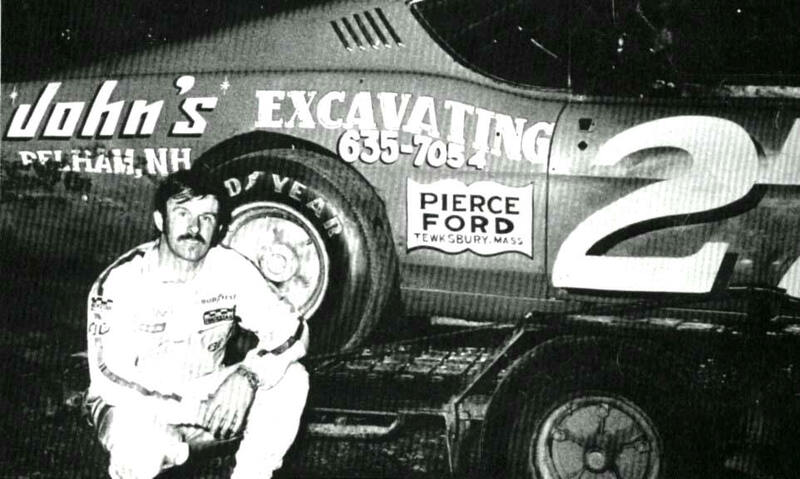 Some of the Massachusetts invaders included Little John Rosati, whose John’s Trucking #36 team had arrived in 1971 with one of the best – financed, most professional – looking operations ever seen at the track. Soon, thereafter, Catamount fans began to see the Bay Staters filter in on the Saturday night late model race programs: Dave Lind, the tire dealer; Bobby Healey; Skip May, with his brother - in – law’s orange Chevelles; Joey Kourafas, with former Norwood car owner Bob Curtiss; Jerry Driscoll; and many others. Catamount, at that time, was a magical mix of those Massachusetts cars, New York teams trying to make the conversion from coupes, returning Canadian stars who had run in the 1960’s, the local drivers; and many Granite State teams, as well. 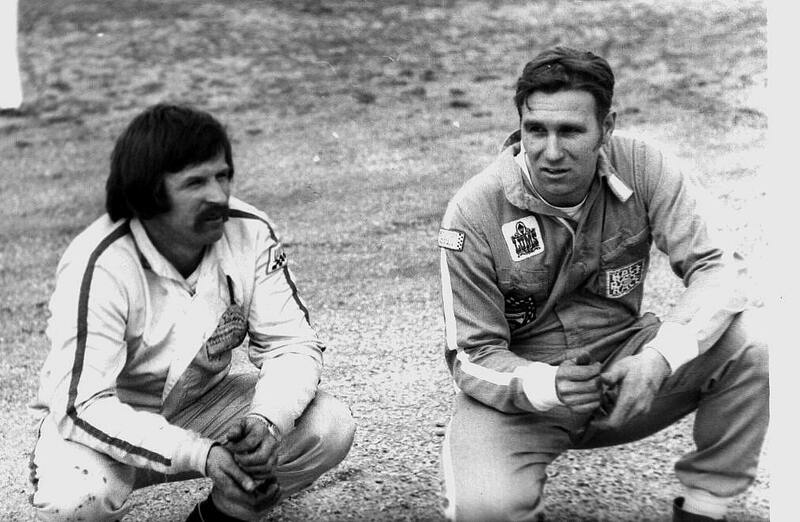 invaders to hit Northern NASCAR in the early 1970’s. Into this atmosphere, one early summer evening, came a bunch with a big, red Ford Torino. We had already seen Ron Barcomb’s immaculate, fast Nordic Ford/Coca-Cola Torino all that season, and Dan Mostrianni had come up once with another red Torino [the # 6PACK], as well. So, no one thought that much about the new arrival. I wandered over to take a curious gander as they found one of the few unoccupied pit spaces. The first of the crew [probably Roger and the other brothers] came out, looking a bit annoyed that people were pressed in to inspect their operation. After a bit, the door to the school bus popped open and out stepped this less – menacing – looking guy with a Sonny Bono haircut. He looked at me, said, “How ya doin’ partner ?”, and set off working with the others. I would like the man from then on. The Torino, in 1973, just before the Stewart sponsorship. There was some serious flooding in that part of Vermont around 1975 or 7; and, as always, Cuttingsville was in the path of flood waters. According to more that one person, Dave and some of the others from the team heard about this and rushed to help C.J. Stewart and his staff to get their auto inventory and other materials to higher ground. I believe it; that’s something Dave would do. sponsorship changed to Green Mountain Ford Dealers, but the special individual bond with Stewart endured. Dave always maintained ties to the village of Milton, VT, where his girlfriend and their daughter lived. Because of this, I ended up having both of the Dion girls. In the course of having Michelle, the younger girl, I had parent conferences which included Dave. We became well acquainted, and he never forgot who I was. I married my wife, Roxanne soon thereafter. Rox and I were on our honeymoon to Maine in 1987. I was in that period of my life from 1987 to 2005 when I didn’t really go to the races because we were doing antiques, and the auctions were at the same time as the races. We happened to be on state route 26, and passing by Oxford Plains Speedway when I noticed they were going to have a race. We decided it would be a great change of pace to attend the races. No longer having credible press connections, we located ourselves in the grandstands and watched a NASCAR Busch Grand National North series race, which Dion happened to win. New England 33. That is Stewart behind the car in the black shirt and hat. Roxanne had heard quite enough of how I had written for Speedway Scene, about how many guys I knew, and all the rest; so, she listened politely to how I knew the guy winning this prominent race and how we were friends earlier. When the race was over, we wandered over into the infield as post – race festivities were winding down. Dave was still on one of those infamous sand mounds in the OPA infield, taking questions about his win. Dave happened to look out, onto the assembled crowd, as he was finishing one of his interviews when he spotted us standing there. I waved, not expecting that he even remembered who the hell I was or wanted to be interrupted. “Bill !”, he yelled, and climbed down off the sand pile. He came over and gave us both a hug. We spoke briefly because I knew he was holding up a number of guys who had deadlines to make. I could see the look on my wife’s face. Maybe I wasn’t completely full of sh—after all. Ford at Richmond in 1979. I think the versions of Dion’s brief forays into the Deep South to try his hand at the NASCAR Grand National series [now Sprint Cup] are so typical of the Dions and how they operated. The old school bus with the bad exhaust, having trouble gaining admission to the Grand National pits; the skeptical and sometimes demeaning way they were received by the regulars; the fantastic times he ran and the high qualifying spot; and even the crappy way NASCAR handling him with the tire availability – they all show what that group could manage with fewer resources than most. Dave Dion never wasted much worry on fielding a show car. Along with Louie Lazarro, he had some of homeliest cars ever seen. And – just like Louie – he had some of the highest achievement, in a sport that now seems to be as much a race to spend money as it does to just go fast, for long periods of time. Dave, who always looked younger than he was and Lazarro, who not only always looked older but probably felt it – as well – would have liked each for what they had accomplished. Vicarious Dave was a contrast to the somewhat shy Lou. Lazarro would have liked and admired each other. Bobby Dragon, of Milton, VT, whose territory he had invaded.